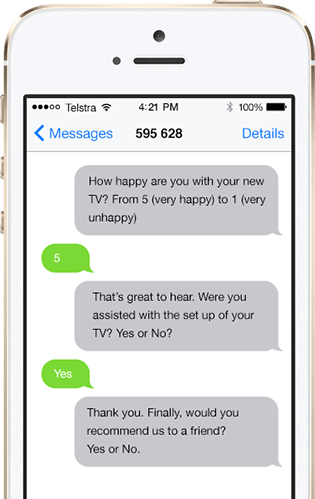 SMS Surveys are a fantastic way for your business to get more of the information you need to improve your customer’s experience. Our online platform makes it easy to design your own intelligent surveys and collect better feedback in a cost-effective, non-intrusive way. The way they work is easy. After setting up an opening message and survey questions in our easy to use online platform, the survey is delivered via SMS to a defined list of recipients. After each question has been answered by the recipient, the next question is sent. Once the survey has been completed, the results can be analysed in the online portal.